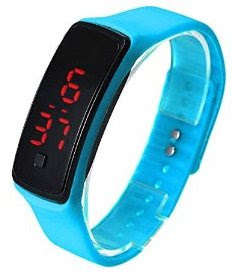 Sports Silicone Digital LED Wrist Watch - Only $3.89 Shipped! Check out this Susenstone®Ultra Thin Sports Silicone Digital LED Sports Wrist Watch for Only $3.89 + FREE Shipping! Display time in numbers indicate the hour, minutes and seconds. Additional RED LED function to show the time clearly in dark areas water resistant. *NOTE: This item may be shipped from overseas and may take a few weeks for delivery.*Hurry!! Amazon's prices change frequently! Click Here to check it out!